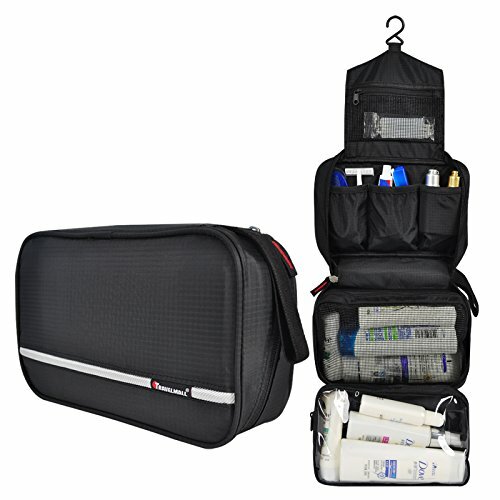 There are altogether 6 compartments:（from the top down) are a small breathable mesh bag for small items like tissue, band-aid, swaps or lipstick; 3 elastic bags side-by-side; another main breathable mesh bag; a transparent waterproof bag. It's easy for you to put all your toiletries in, and the bag will keep them safe, neat and organized. Compact and organizered: Even if we're surprised how large the capacity is, when zippered, it looks very handy so it doesn't take up your space in suitcase. Friendly design: The additional hook and handle, convenient carrying, convenient taking out of your things. Unique visual window design, easy to use, but also has the function of moisture proof.